Silver Clay 950 – so a modeling clay, which must be stamped as sterling silver. 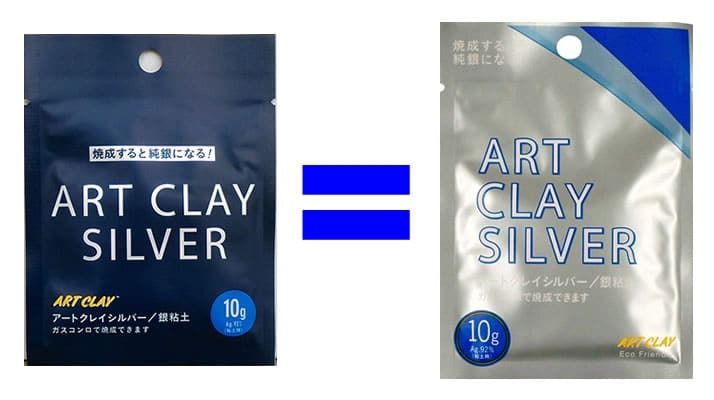 From other manufacturers such as Art Clay and PMC since a few years exists silver 950 as modelling clay. But no paste and no syringe. Prometheus Silberclay 950 is available in all three textures – clay, syringe and paste. It is more stable than fine silver clay due to its lower percentage of silver (95%) and is therefore particularly suitable for rings and other pieces of jewellery that are a little more exposed to everyday life. They just scratch less. So it is especially intended for artists who sell their self-designed jewellery. Unfortunately, Silberclay 950 was previously only available as a modeling compound. Paste and syringe to be produced by user himself/herself. This is quite easy with a silver paste by using distilled water, but more complex and complicated with silver syringe. Prometheus Silver 950 closes this gap. Prometheus Silver 950 is available in three package sizes: 10g, 25g and 50g. And syringe and silverpaste with 10g each. This product series opens all possibilities for Silberclay 950, which we you know from fine silver clay. Already last year we had the chance to test the new modelling clay before sales launch and were fully satisfied. The paste and syringe were not available at that time, but Roswitha Schwarz (www.rosart.de) was able to successfully test the Prometheus Silver 950 syringe a little later. Like always in a product test we start with small, simple jewellery. And this time we had only a small amount of silver clay which had to be enough because of the preliminary test. Prometheus Silver 950 is as easy to work with as you would expect it from other silver clays. After opening the package, work started immediately. Prometheus Silver 950 is a ready-to-use modelling clay. At the first sight, Prometheus silver modelling clay seems to be drier and “more like leather” than other silver modelling clays.</span> But this is no problem during modelling, the reverse is true: When it comes out of the pack, Prometheus Silberclay does not stick to your findgers, the fingers stay cleaner at work. Nevertheless, it is still a good idea to rub some vaseline or olive oil onto your working mat. You can roll out the Silver Clay as usual and shape it into rings or chain pendants. But please do not try moistening the modelling clay right at the beginning. Structures that you may have already shaped into the silverclay may suffer from it. Unfortunately, you can also see that in our small experimental parts. Prometheus Silver 950 must dry completely like any other Metal Clay. After that you can fire your silver 950 jewellery: Prometheus Silver 950 is fired in the kiln at 800 ° C in one step and without activated carbon . This is not self-evident for a silverclay with a silver content of only 95%! A firing time of 60 minutes is also not to much for a non fine fine silver clay. The advantage of Prometeus Silver 950 is one-step firing process, which takes less time than a two-step process. he firing process itself remains simple: place the Prometheus Silver 950 jewellrely in the (cold) kiln at room temperature, heat up to 800 ° C and hold that for 1 hour.</span> You do not need a kiln with ramp control. Here, Prometheus Silberclay 950 clearly has an advantage to some other big brands of silverclay 950. During the firing process Prometheus Silver 950 shrinks by 15% (manufacturer) – here others are ahead, but without a really big gap. After firing Prometheus Silver 950 needs grinding and polishing like other metal clays. As usual, the white oxidation layer must be removed carefully and the jewellry – as desired – polished to a mirror finish. Now you can see the difference to a piece of fine silver clay: The color of the (almost) sterling silver clays is slightly darker than that of fine silver clay. A further special feature offered by Prometheus in his first Silver Clay: A strip of (fired) Prometheus Silver 950 can be bent with the pliers. It is bendable or flexible if you like. This is handy if e.g. the ring has not completely turned round and you want to repair this with the pliers. One more important information, even though we did not have this situation: You can join broken pieces from Prometheus Silver 950 together or combine parts of Prometheus Silverclay 950 and sterling silver pieces with Prometheus silver 950 paste. In greenware and with already fired pieces ! We can recommend Prometheus Silver 950 with a clear conscience. The clay worked as expected and we had no problems modelling and firing. However, the new silver clay should rather appeal to jewellry artists and private users than course instructors. Because the firing time of one hour is simply too long for an one-evening course. And of course, people suffering from allergies have to be careful, as always with sterling silver jewellery! If these restrictions do not apply to you, there is nothing to stop you from using the Prometheus Silverclay 950. Look for and buy Prometheus Silver 950 in our Akisashop!